Days: September 16-18, 2014 NOTE: this event has already happened, find current-year events on the events page. 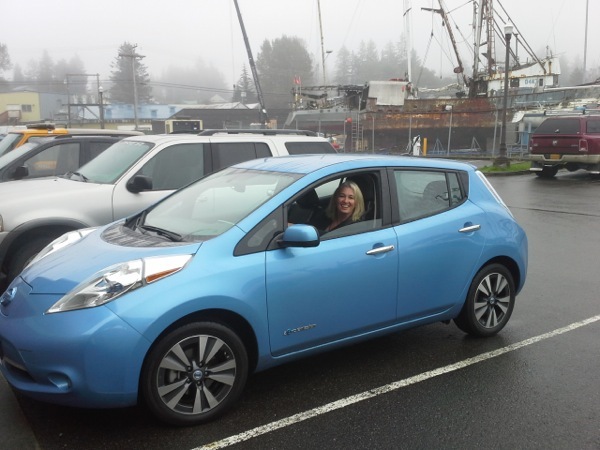 The Southeast Alaska event was a successful introduction to many folks who had never seen an electric vehicle or had the opportunity to drive or ride in and EV. Juneau Hydropower, Inc. sent one of its electric vehicles from Juneau to Wrangell on a State of Alaska Ferry to support the Southeast Conference. The Conference was attended by Southeast Alaska Mayors, Elected Representatives, electric utility managers and employees, key business leaders of the tourism, seafood and energy sectors along with representatives from the Governors Office. The three day event started with a presentation on the Future of Electric Vehicles for Southeast Alaska along with an update of the continued deployment of public charging stations for the Capital City of Juneau. The presentation included key metrics on comparisons of gas prices in Southeast Alaska compared to the electric rates. We are holding an EV ride event at Southeast Conference which is a meeting of 26 communities of Southeast Alaska that is held every year. Southeast Conference was founded in 1958. Conference event falls in the National Drive Electric Week. Great synergy. Great Opportunity. The Juneau Economic Development Council (Econ development organization of the Capital City of Alaska) will be presenting at SE Conference on Electric Vehicle initiatives in SE Alaska and why EV’s make sense for SE Alaska. Juneau Hydropower Inc. will be sending a company Nissan Leaf for ride and share for the 3 day event for any attendee and community members to ride or drive an EV. The Date of this event is September 16 through 18 at Wrangell Alaska. The event will take place at the Nolan Center in Wrangell.